The GTN 650 GPS/Nav/Com has been removed, The tray and wiring is there. The 396 GPS shown in the photos does not go with the airplane. This Airplane was in storage after owners death, Original Logs could not be located. 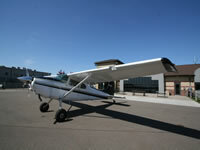 The airplane was ferried for an annual in July of 1979. Logs were started in 1979. Several instances of Damage, as indicated in the FAA Airworthiness Records provided below. Current owner bought it in 2004. The airplane is a candidate for paint and interior. Adobe Reader to view the documents. You can download it here if you don't have it.